My father's older sister was our unofficial family historian. When she passed away a few years ago, I stepped into the role. I'll always be grateful to her for the work she did. She meticulously documented at least three generations (back to her great-grandparents) on both sides of the family. She exchanged letters with distant cousins, wrote down her personal recollections, and did it all by hand ... no computers. She did have a copier, so she made copies of the lineage pages, newspaper obituaries, and old family photographs similar to the one below. Then she organized the pages in loose leaf binders and gave one to each of us. She was a talented artist, did beautiful crafts, wrote a self-published cookbook (sold every copy), and taught Sunday School for 50 years. She was my inspiration for this post. I decided to set a table for eight in the solarium. It was late afternoon when I took the photographs, so I went ahead and lit the candles. I printed some old family photographs on card stock and framed them in silverplated frames from estate sales. The frames cost from fifty cents to two dollars. I feel fortunate to be the keeper of our old family Bible. It was published in 1893 and belonged to my grandparents. It contains all the records of their immediate family. Obviously, it's old and tattered, so I handle it very carefully. For the record, I wouldn't really use it on a table where food and drink were being served. As soon as the pictures were taken, I whisked it away ... back to its usual place. The photographs are of my great-great grandfather and his second wife, two of their daughters, and a daughter with her two young sons. My great-great grandfather was a country doctor in Coffee County, Tennessee. His grandparents had been among the first families to settle the county. I’ve been to visit their (my 4th great-grandparents’) graves in the old family cemetery. The cemetery has a state historical marker, and it’s located in a rather posh subdivision near where the family’s grist mill and paper mills had stood. If the young woman appears to have a less-than-gleeful expression, it could relate to the fact that, at the age of 16, she married this man, 42 years her elder. She bore him seven children, five of whom lived past infancy. Sarah, (or “Sallie”) was the younger sister of the doctor’s daughter-in-law. My father remembers her (Sallie's older sister), Nancy Adeline Priscilla ("Nannie," his paternal grandmother). My dad's father was fifty when he was born. The men in the family were certainly .... vigorous, weren't they? In those days men didn’t travel far to find their brides. I’ve read that staying within a twenty mile radius was typical. “Allied” families often migrated together and settled in the same community. The doctor married Sallie the same year his first wife died (he already had seven children who needed tending!). My brother made the tall candleholder in the center of the table for me. He used our grandfather's forge and blacksmithing tools. He's often invited to demonstrate at craft/heritage fairs and does commissions. He made a beautiful wrought iron arbor for his daugher's outdoor wedding last year. It's now in her garden at the house she and her husband are renovating (her mother's great grandparent's house). The metal candleholders (with wooden bases) flanking the center one are Hobby Lobby clearance finds. He also made the small candleholders you see in this photo. It appears that I need to invest in some dripless candles, doesn't it? The smiling young woman with her two young sons is my (half) great-great aunt, Grace, who was also a cousin, many times removed, on my great-grandmother’s side. Genealogy can become very complicated, can’t it? My brother works in metals, and I dabble in watercolor from time to time. I thought the solarium was a good place for some of my more colorful efforts. For the lily painting, I worked from a photograph I had taken. The others are abstracts. 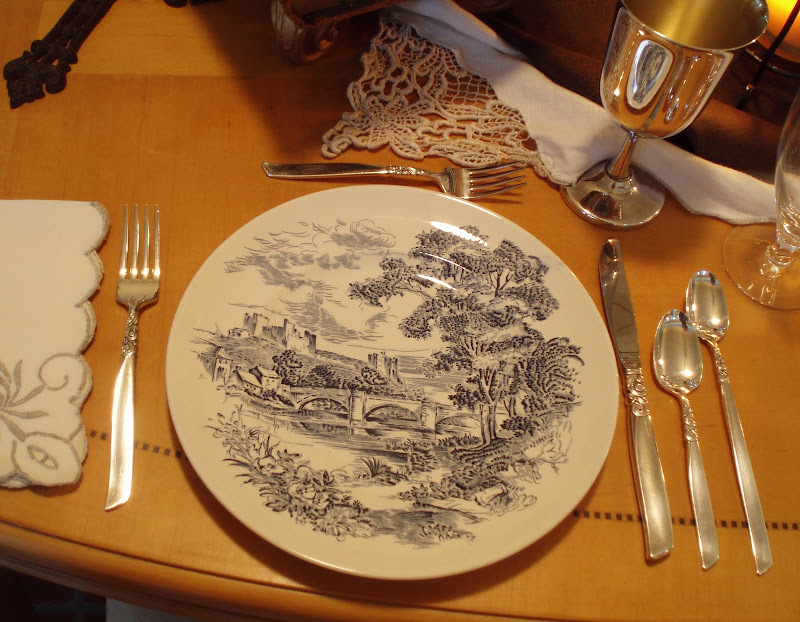 The plates are "Countryside," English transferware by Enoch Wedgwood, manufactured from 1966 to '68. Enoch, a cousin of the more famous Josiah Wedgwood, founded his company in 1860. It's less valuable than "real" Wedgwood, but I think the quality is perfectly acceptable. I bought an "almost" service for 12 at a local antique mall on sale for $50 recently (it was on sale for a bit more than that, but I made an offer, and it was accepted). It's missing a few bowls and small plates, but has plenty of dinner plates and cups ... all in very good condition. The flatware is "South Seas" by Oneida (1955-'65), another antique mall purchase. The silverplated goblets are from an estate sale. They were priced at $8 each, but I ended up purchasing 8 for $20. It was the end of the last day of the sale ... when prices become VERY negotiable. The crosses are all from Hobby Lobby, purchased at 80 to 90% off. The water glasses are Fostoria's "Puritan" pattern, manufactured from 1957 to '71. I like the clarity and the clean lines. They came from an indoor flea market in Illinois ... 8 for $20. The crochet-trimmed cloth and vintage napkins were estate sale finds. The brown faux-leather fabric came from a yard sale and cost fifty cents. I think that about covers it. I hope you enjoyed dining (sans food and beverage) at this Family table. I'd love to hear from you! Who was your family historian? Who inspired you to be creative? Who was your most fascinating ancestor? Bill I am so glad you got a tablescape published today, I was going through withdrawals from your postings since Monday! Spent the week reading your archives. I love love love your descriptions and the thoughtfulness you use in creating your posts. I hope someday to get it together and set a family table (on a smaller scale) with my meager items! Thanks for the inspiration! Bill, I enjoyed this post so very much. Loved hearing about your family! We have the same dishes. Ours belonged to J's mother. She picked them up,here and there at auctions and garage sales. I still use them. Well Bill this post is right up my alley isn't it.. First you start off with family history and genealogy. I research every chance I get, for myself and for others. I have 2-3 separate family trees going at any given time. The family bible is such a fabulous thing to have. I have searched out families to tell them I have seen their family bibles for sale on ebay before. (very time consuming)I just can't stand the thought of the bible going to a stranger. So glad you moved it before the food and drink appeared. Lastly you brought a smile to my face when I saw my Mother's South Seas flatware on your table. Now she never set a beautiful table like this but she tried her best to keep us fed and those pieces were in everyday use for many years. Once again a delight to be here. I love this post! It gave me chills, it is so endearing! I think it's wonderful you know and cherish all your family history. And such a talented family! Your brother's work is extraordinary! And, Bill, you DABBLE in watercolor??!! It's breathtaking! I'm so sorry, I can't even comment on your tablescape because I am still so taken with everything else your post is about! I'm going to have to review this post and block out these awesome tidbits. I wish I knew my family history but I only know (from my Mom's side) one great-grandmother moved from Ireland to England and changed her name from Bridget (we don't even know what her real last name was) because the English hated the Irish and she tried to pass herself off as English, then she came to America and worked as a servant. On my Dad's side, his grandmother was German and she was here working as a chambermaid in an inn when a man walked in and said, "Is there anyone here who wants to marry me? I have a farm you will have to help me with and three sons you will have to take care of." And my great-grandmother said right away, "I'll marry you!" And she did and they had ten more children! Hi, I just loved your post...loved hearing all about your family history. Thanks so much for sharing this today! I really enjoy your blog, thank you! Hope that your day is a wonderful one! It truly is a pleasure to visit your blog. Your post are always so interesting and well written. I loved learning more about your family! I love your tablescape and I adore your family bible, I've always been drawn to old bibles and have been fortunate to collect several. Your brothers work is beautiful and your water colors are amazing! Unfortunately, I don't know much about my family history past my Grandparents, something I would love to do someday! 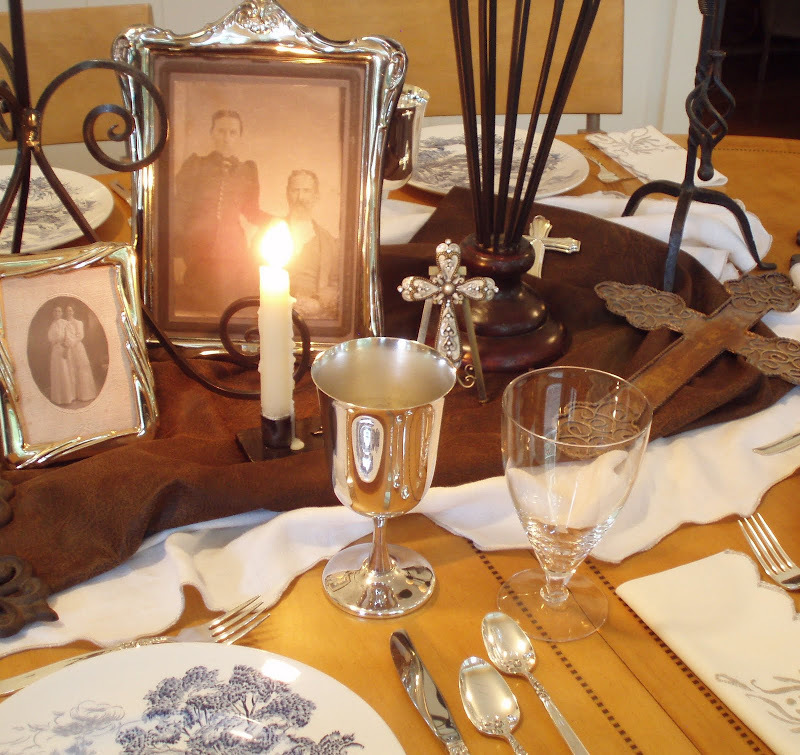 What a beautiful and intriguing tablescape, with so much history woven in too, it truly is wonderful. You certainly have some wonderful family treasures. Love that you have created a lovely table around them. The family Bible is certainly priceless and I'm glad that you are protecting it. Wonderful table. I can see a family sitting around it and conjuring up the ghosts of family past! Bill, it looks like your brother is as talented as you! I love the candleholders he made. It was such fun reading about some of your ancestors. It's so neat that you've got that wonderful old Bible. You can tell that it was really loved and used, as it should be. As always, you've set a gorgeous table! Loved this - what a talented family you have. One of my greatest joys was working on a family book with my dad a few years ago. We've got family stories, history and recipes all withing this huge book that goes back to his great grandparents. It's fun to look back and see what life was like a few generations ago. Love the old photos. Bill-Researching my side of the family really is next on my list of things to do--You are so fortunate to have had it done for you. I know it is time-consuming. My husband's half-uncle spent years researching that side of the family and has published it for all of us. I'm the only one who is remotely interested and they are not even my relatives by birth :)---love,love.love those goblets. Take care of that Bible! I loved this table, the colors are warm and refined. Your flatware is so pretty and delicate and fits perfectly. As always, I enjoy the tour of all your collectibles, especially the family history. 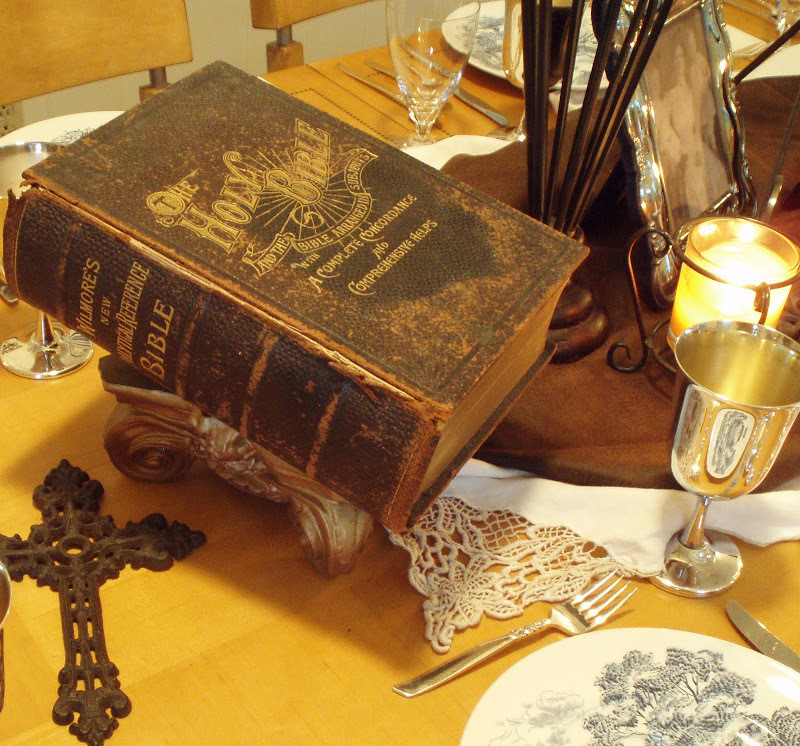 I like the idea of using a Bible and the specially crafted candle holders to add that special touch. Bill, this is by far my favorite tablescape. I LOVE the old pictures and family Bible. They are so rich looking together and I love the vintage feel. Beautiful! Bill, your table is very pretty. I can't believe you got such a good deal on the china. Nice job. I love that you mixed the candlestick made by your brother with others from the store. Also, I love the vintage pictures and Bible. What a nice "heritage" table. Love all the history - WOW ! Beauty of a table ! Once again you have set a beautiful table. You have a very talented family, the candleholders are great. The family treasures are priceless. Very pleased to have found your blog through Susan. LOVE the feel of this Tablescape. I love family history and everything old. Those dishes just have my name written all over them! :) My husband's cousin is very, very much into family history. I am amazed at what he has uncovered. We know much because of him. No so much on my side. Funny you should ask about creativity. Just today I was thinking about a woman whose name I don't even know. I was in her home as a teenager and was SO impressed with her decorating style. To this day, I think she was what first inspired me to notice beautiful surroundings. Bill, you WOW us again! I love every detail you share. It's obvious that talent and creativity runs deep in your family. VERY nice. I love that you created a table in honor of your aunt. It is so pretty, yet with a masculine feel to it as well with the leather look fabric, iron pieces, solid crosses and weathered family Bible. Sadly, our family hasn't really had a historian. Seems like everyone is so independent and the family does not often gather together. I do have a cousin on my mother's side who is researching that side of the family, but with difficulty as the parents died young and the family split up. Bill, I so look forward to Thursdays each week so that I can see what beautiful tablescapes you have put together. You never disappoint! I loved reading the family history and young Sallie jumped into a relationship with an older man who was old enough to be her Dad and then had to take care of his 7 children would certainly raise an eyebrow in todays world:) I love the old photos in the frames and also to find that your brother is also so talented in his designs. Your table and home are just lovely and I enjoyed peaking in today. Thank you for sharing your story and table with me as you certainly are a gracious host. Oh, what a sentimental table. 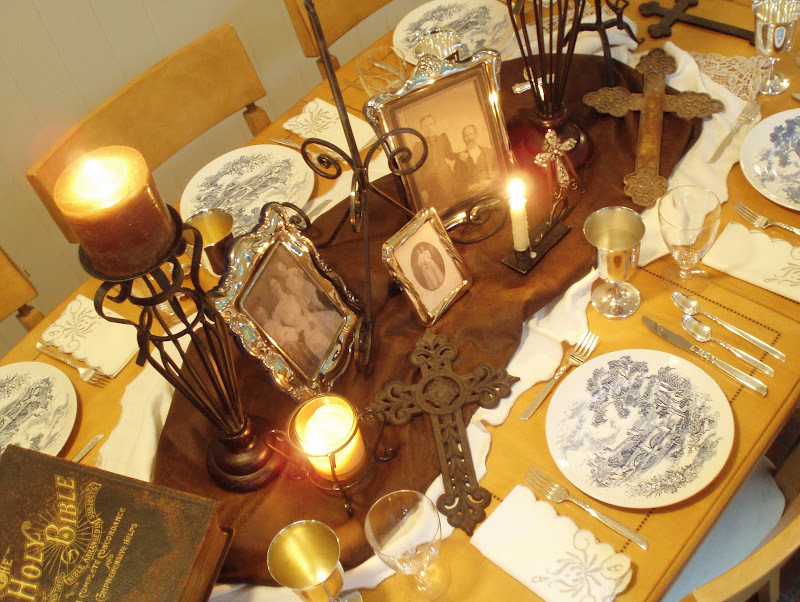 I'm so impressed that you put so much time and thought into every detail Love the cross, family bible, old family photos and handmade candlesticks! Amazing! Wouldn't this be a wonderful setting for a family reunion?! Wonderful! I love to include the "old folks" for dinner ... even if they are looking out from a frame! that was absolutly wonderful! i loved all your personal touches, and such a pretty setting too. What a great table -- there is nothing like family. You are lucky to have so many pictures of your relatives. You always have such pretty things and have such great finds. And you always put together such a pretty table. 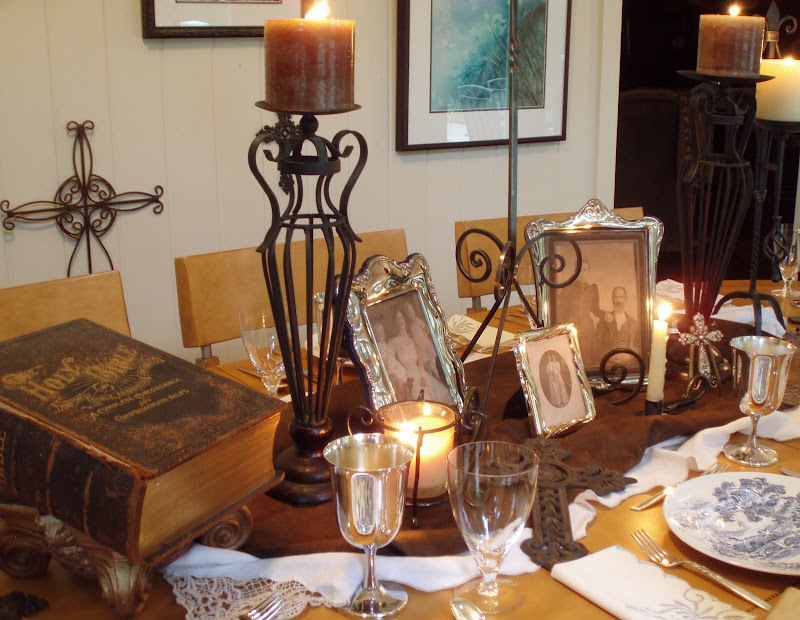 I really enjoyed your tablescape and especially enjoyed the genealogy....I too am an avid genealogist of our family...mostly my hubby's family and have found some wonderful and interesting stories and facts. That was fascinating reading, Bill. Imagine that poor young woman taking on seven stepchildren to raise... And that was just the start! I, too, have traced my family history back to an intrepid great great grandmother who rode a flatboat down the Mississippi with her family and ended up marrying the captain. 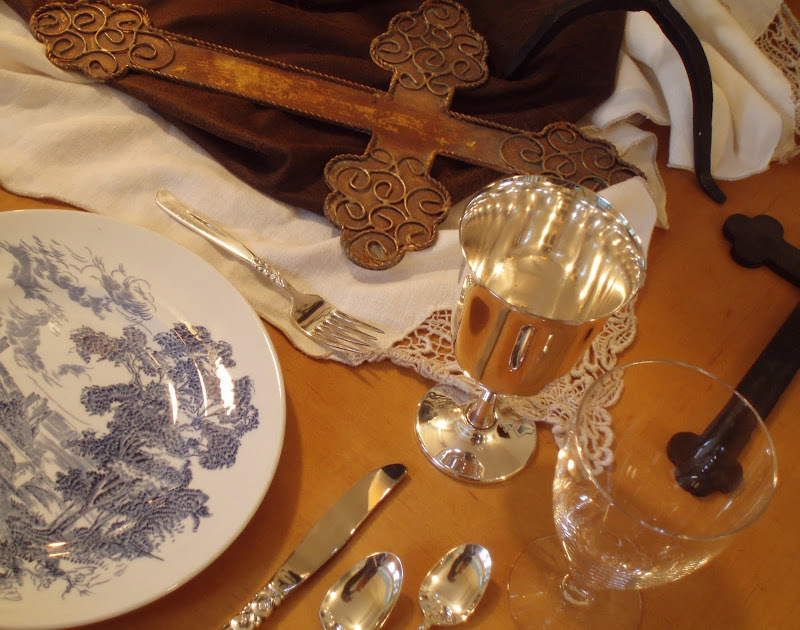 Life was sure hard in those days... As usual, your tablescape is carefully and artfully executed, a beautiful post. How lucky for you to have a great aunt so dedicated to keeping your past. I guess I've become the unofficial historian of our family, but the "books" passed down to me are scattered bits. Enjoy your legacy and pass it on. Hi Bill, I just don't have words to say how beautiful your table is! To honor your sister, and your family, and your heritage, and you heirlooms, is just too wonderful for words. Thank you so much for sharing the lives of those you love ...they did a marvelous job of inspiring you! I love it! Bill, I enjoyed the story of your family lineage. I guess I am the unofficial family historian... at least I'm the one that has the family at Ancestry.com. Your Tennessee roots run deep, as do mine... There were several men in our family tree that married 2 or 3 times after surviving younger wives (who mostly died from complications in childbirth). It was tough to be a woman in those days! Beautiful table AND words Bill. Love your solarium and that bible is so amazing. Great post and inspiration to us all to embrace our history a bit more. My grandfather was 35 when he married my grandmother who was 16. He already had two sons. My grandmother gave birth to four children after they married. Very interesting to read about some of your history. You have some beautiful treasures and loved the olf family bible and the old photos. First, the artist in me must comment on your watercolors...They're lovely! I love your color choices. They would fit right in my office! Thank you for the glimpse into your family history. What a legacy! Not only did you inherit your aunt's artistic abilities, your dedication to continue researching, recording, and sharing your family history...following your aunt's footsteps...is a special gift you are giving generations to come. Bill, Very inspiring post. Your tablesetting is very appealing! Bill, This is my first visit to your blog, but I will be back. Your tablscape is lovely and I was fascinated by the story of your Aunt. What a wonderful thing and I am sure you will pass the history of your family to someone. I love the old Bible and know it is a treasure. What a wonderful post. I love the thought and creativity you displayed along with your tablesetting. It sounds like you have alot of talent in your family (starting with you), and you are the perfect choice to be the new family historian. Thanks for sharing... everything was just lovely. First - You are very talented! Really like the picture. 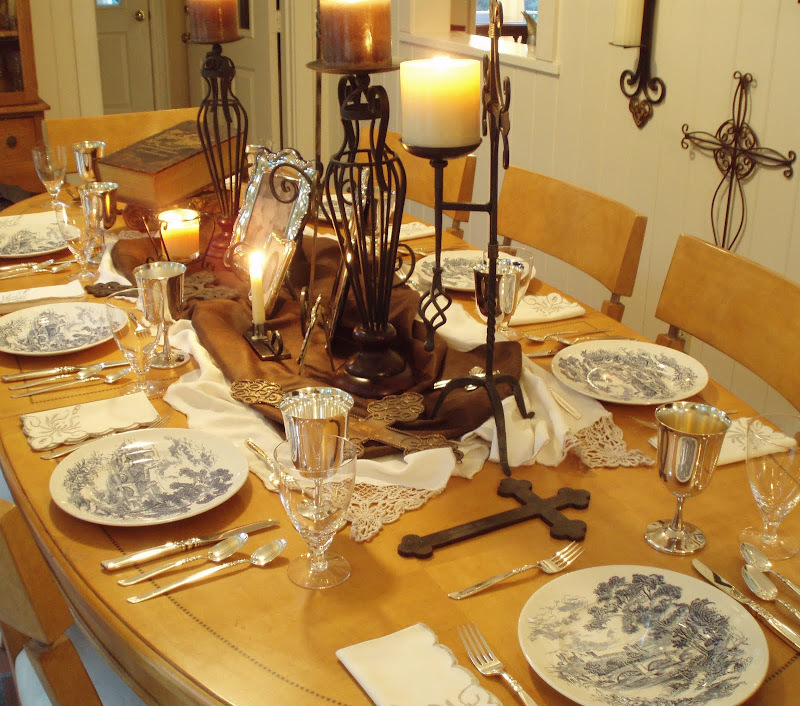 What a pretty table setting - so many pretty pieces and at great prices. It is so nice that you have so much info. about your family. My sister has done a lot of work on our family history, but she came to a dead end. It is a shame that now days so many children are growing up knowing nothing about their ancestors. Bill, I had an entire post written to you that disappeared because my computer decided to update itself. In the interest of time, let me first say that your table is beautiful and so are your paintings! 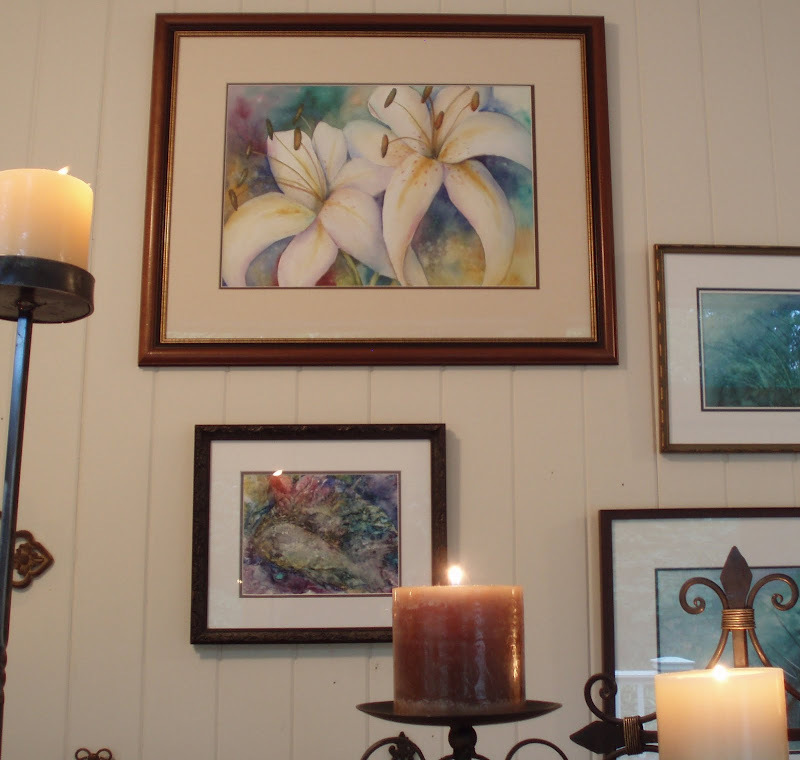 You've been holding out on us that you are a talented watercolorist. I love your gallery wall. As to genealogy, I love your homage to your family. And to answer your question, I'm the buff in our family. I had written some funny stories about a couple of illustrious ancestors when my computer shut down to update itself (I forgot it was doing that), but I'll just briefly say that one of most interesting ancestors is the Rev. Roger Williams who was the founder of Providence and the first governor of RI. Roger got the left foot of fellowship from MA (he preached, among other things, that the King stole the land from the Indians), and he set up shop in RI after he faced certain deportation and fled through snowfilled woods to escape. The Indians sold him land, and the rest is history. Unlike his somewhat uncharitable hosts in MA, he displayed more chairty when he saved the same folks from massacre by agreeing to negotiate peace for them with some tribes who wanted their scalps and probably quite a few other key body parts. His negotiations were successful, but I think they did eventually have a conflict betweent the Massacusetts settlers and the local tribes. Roger, though, was well liked by the Indians. Sources say he was very handsome and extremely well educated (he went to Cambridge, and as I recall Jesus College). He is known as the founder of the Baptist Church in America (as he embraced certain of the things they believed), though he wasn't worshipping with any parituclar group (other than his wife)when he died. Out of the North and onto the South... do you have any Cottons from Tennessee by chance in your lines? P.S. And Bill, I'm leaving for an extended blog break. I will see you when I return if not sooner. If you do have Cottons (or Dicksinson or Dickersons), please email me at my blog. My email address is on my profile page. You can click there and send me an email. P.S. Again... that is SO neat about your brother making that candlestick and doing blacksmith demonstrations. There is a blacksmith who does that for the living history museum, and I have three large nails he made that I bought in the shop. I have them displayed on a small wall cabinet I have. But your candlestick is REALLY neat. It is wonderful so have so many lovely pieces with a history..
Makes it very special, Bill! I am the family historian in my family and have many similar treasures. You've showcased them beautifully on your table. Simply lovely!! Thank you for sharing. Bill, I would love to know where in the world you put all your table pretties. You seem to have so many! If you're like me, they're beginning to end up in every nook and cranny. You have unbelievable taste, very creative writing, and some of the most beautiful pieces I've ever seen. As for the genealogy, I don't really know mine. I was separated from my parents at birth and lived with a great-grandmother until I was 13, when she died. Pretty much on my own then, but lived with a few relatives from time to time till about 16. Have lost track of everyone now. I wish I could set you loose on my bunch. I have two sisters I've never met, and probably don't even know I exist. Sad really. 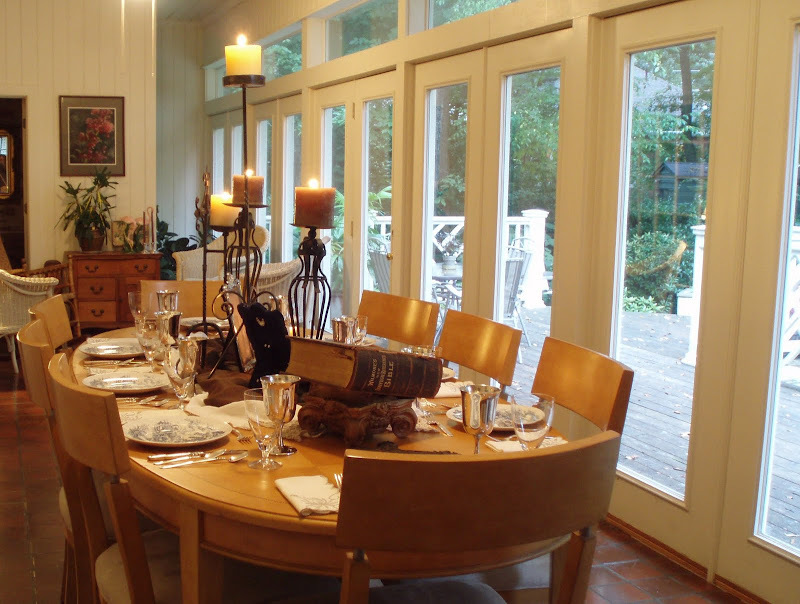 Bill~what a great tablescape and beautiful post! I love the dishes...they are perfect with your display of heirlooms. This is a beautiful tablescape. Thank you for sharing your family history with us. 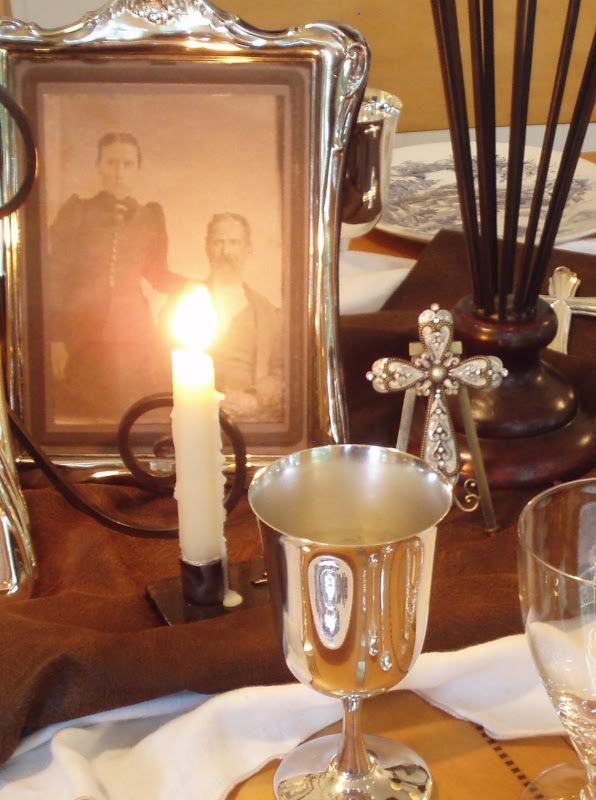 Bill, you set a beautiful tablescape and I enjoyed learning a little of your family history. You come from a very talented family - beautiful artwork and beautiful iron work. Bill, what a great post! I thoroughly enjoyed hearing about your family history, and your table is, as usual, so very beautiful! 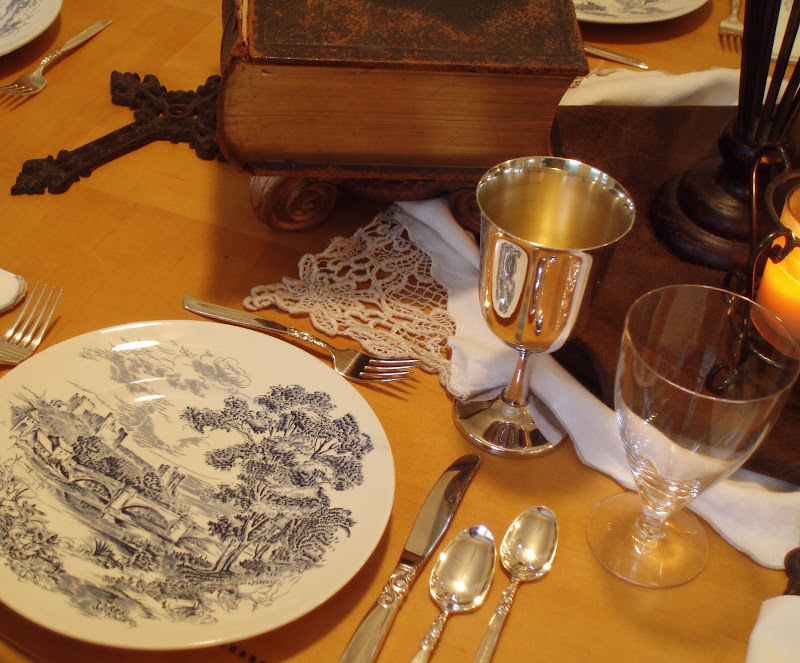 The dishes, napkins, silverware, goblets, and stemware are all so pretty. I love that Bible ... what a treasure! Hello! This was a great blog!! Your tablescape is beautiful. Thank you for sharing a personal touch with us all!! You are very talented! The tablescape gives all of us thoughts of family. I enjoyed your genealogy, you would love hearing my husbands and how they settled Texas. The table has many pretties, but the best to me is the china. I have the teapot to Countryside. I watched it for a long time before they discounted the price. I picked it up and have really enjoyed it, since tea parties are so much fun. That is just what you did and are now enjoying a thrifty purchase and a great quality china. 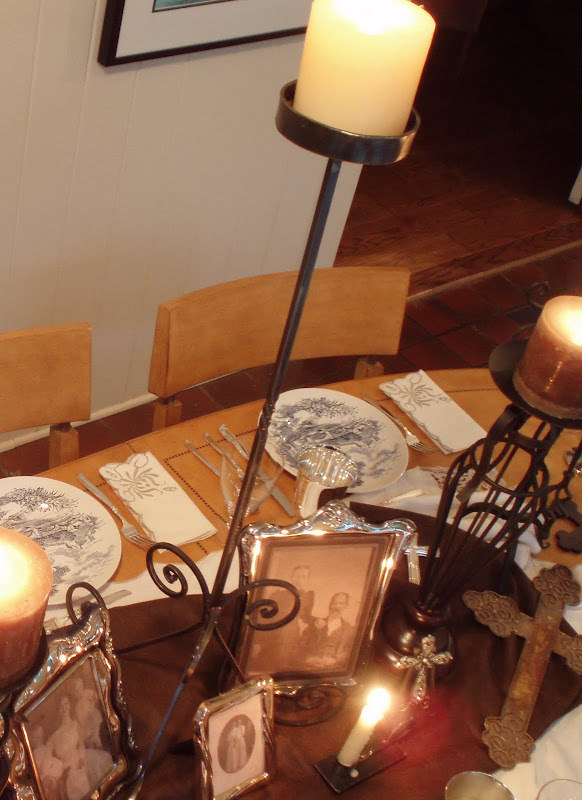 Thanks for the wonderful tablescape of your family! Bill, what a beautiful story along with a simply stunning tablescape (again). I am IN LOVE with the Puritan crystal. Thank you for sharing your family history with us. Hi! This is my first time to visit your blog. I somehow found Between Naps on the Porch, and I clicked over to look at your tablescape. It's just lovely by the way. So unique and beautiful. Hi Dear Bill! Oh, I loved your post today! Your table is lovely and those dishes are beautiful! But really enjoyed hearing about your ancestry! What a blessing to have had an aunt who really cared about preserving the past for future generations! I love this. My husband was blessed to have received so much genealogy from a relative and I was sad because I didn't know much of my own. So I started digging and researching and have come up with quite a bit of information. Oh, by the way, your room here is gorgeous! You really have a beautiful home and I'm hoping you will continue to show it to us. I'm off on a trip and got a new lap top, so I'm checking in on my favs! 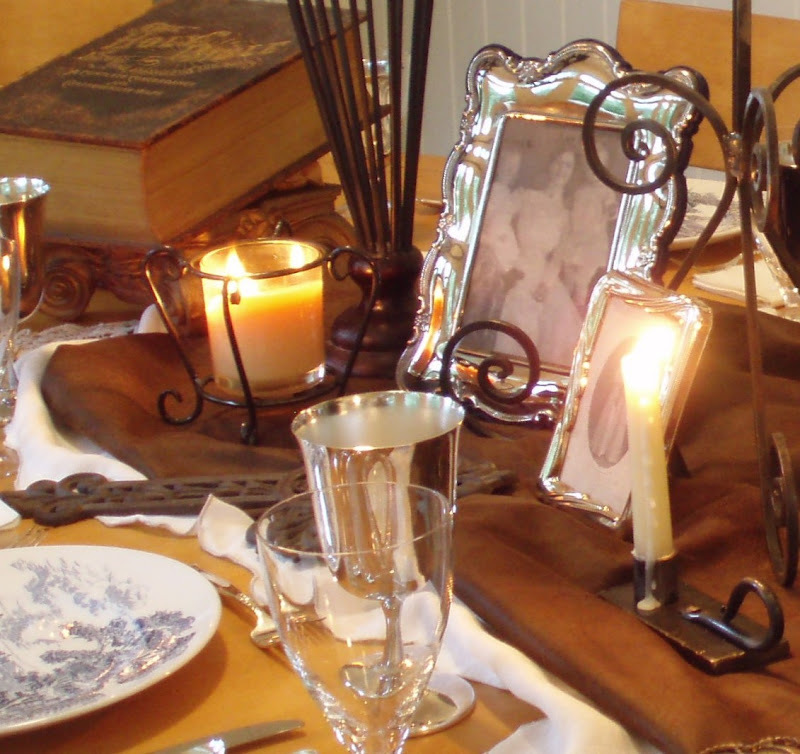 Beautiful tablescape to celebrate your family history. How lucky that you had someone who was thoughtful enough to write it all down and collect the memories for generations to come. Wow, love it! It is inspiring me to do more with my family portraits. The Bible is special, indeed. One potrait that stood outis the the mom smiling with the 2 children. That is so RARE. You never see that as they usually have their serious face on. Makes it more special! Bill, I know this is an older post, but I just discovered it! I love your family table! I am the family historian. I have been researching my family history for about four years. I started after my dad's death. He had done all he could until his health worsened. He was not able to get very far, because he did all his research in person--no computer! I picked up where he left off and have traced one line back to 15th century England! He would be so excited! One of my most interesting ancestors is my maternal GGGrandmother. She married my GGGrandfather who was about 35 years her senior, bringing 2 sons and her mother to the marriage. She bore him 3 children (one of whom was my GGrandfather). She then left him, taking the youngest child and her mother, and ran away to Virginia with another man and bore him a child. The funny thing is that no one in my family knew about this. All we knew was that my GGrandfather and his older sister were raised by another family. No one knew why and my Grandparents NEVER spoke of it. They took the story to their graves. It was a family disgrace, but I finally located a distant cousin whose mother had told her the story. Thank Goodness! I suppose she is the "skeleton in my closet"!